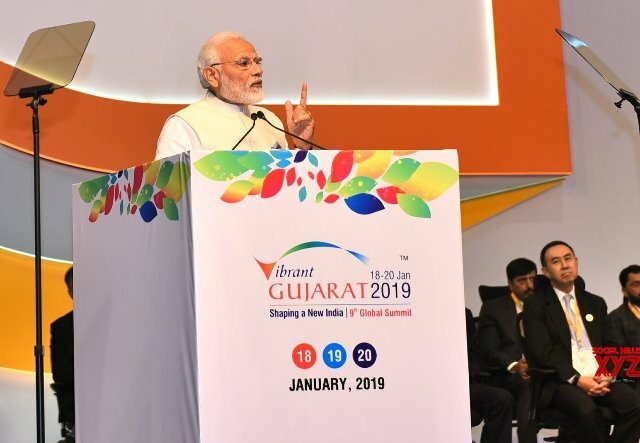 Prime Minister Narendra Modi has inaugurated the three-days 9th Vibrant Gujarat Global Summit in Gandhinagar, Gujarat (18–20 January 2019). Five countries Heads and more than 30,000 national and international delegates, including CEOs of major companies from India and abroad, are attending the event. There will be an exclusive Round-table Interaction of Prime Minister with Sovereign Wealth Funds, Pension Funds and Institutional Investors. Earlier, Prime Minister inaugurated Vibrant Gujarat Global Trade Show which is part of the Summit. Vibrant Gujarat is the name given to a biennial investors' summit held by the Gujarat government. The event is aimed at bringing together business leaders, investors, corporations, thought leaders, policy and opinion makers; the summit is advertised as a platform to understand and explore business opportunities in the State of Gujarat. President Ram Nath Kovind inaugurated the three- day Gandhian Resurgence Summit at Parmarth Niketan camp at the ongoing Prayagraj Kumbh. About 300 Gandhians from different parts of the country and organisations are participating in the Summit. Earlier, First Lady Ms Savita Kovind honoured 9 women from traditional boat community for their contribution to the Kumbh. More than one thousand CCTV cameras have been installed in the Mela for the purpose. Prayagraj Kumbh 2019 will be remembered for the opening of doors to Akshaya Vat (sacred tree) and Saraswati Koop (sacred well) for common men after 450 years. It was a long pending demand of the devotees. India-Myanmar bilateral army exercise ‘IMBEX 2018-19’ (2nd edition) commenced at Chandimandir Military Station at Chandigarh. The aim of this six days joint training programme is to train the Myanmar delegation for participation in United Nations peacekeeping operations under the UN flag. The exercise includes the participation of 15 officers from the Myanmar Army and 15 officers from the Indian Army. The Union Minister for Commerce and Industries, Suresh Prabhu has inaugurated the 10th edition of the India Rubber Expo - 2019 (Asia's largest rubber expo) in Mumbai. The event offers a unique opportunity for Indian companies to meet and collaborate with overseas companies. The rubber industry will continue to grow faster, create more employment opportunities, increase exports and add to the economic output of India. The government is working on a comprehensive technology strategy to increase India’s economy and improve ease of doing business at the micro level. The Union Cabinet has approved recapitalisation of Export-Import Bank of India to the tune of 6,000 crore rupees and increase in the authorized capital of Exim Bank from 10,000 crores to 20,000 crore rupees. Recapitalisation bonds will be on the lines issued to Public sector Banks. The union cabinet also approved expenditure sanction of over 4200 crore rupees for Integrated E-filing and Centralized Processing Centre 2.0 Project. It will also help in improving taxpayers' awareness and education through continuous engagement. The Union Cabinet also gave its nod to Revised Cost of Estimates for 13 new Central Universities of over 3639 crore rupees. The amount being sanctioned for recurring cost and creation of necessary infrastructure for the completion of campuses of these universities. These new Central universities are in the states of Bihar, Gujarat, Haryana, Himachal Pradesh, Jammu and Kashmir, Karnataka, Kerala, Odisha, Punjab, Rajasthan, Tamil Nadu and Jharkhand. The infrastructure development work will be completed within 36 months. The Union Minister Dr. Jitendra Singh has inaugurated the UNNATI- (Unispace Nanosatellite Assembly & Training) programme organized by ISRO in Bengaluru. ISRO will train 90 officials from 45 countries in three batches. UNNATI is an initiative by ISRO to commemorate the 50th anniversary of the first United Nations conference on the exploration and peaceful uses of outer space (UNISPACE-50). UNNATI programme is planned to be conducted for 3 years by U.R. Rao Satellite Centre of ISRO in 3 batches and will target to benefit officials of 45 countries. Amit Khare (Information and Broadcasting Secretary) and R S Sharma (TRAI Chairman) jointly inaugurated the 25th International conference and exhibition on terrestrial and satellite broadcasting ‘BES EXPO 2019’ in New Delhi. Around 300 companies (from 25 countries) are displaying their products at the Expo. On the occasion, an exhibitor's directory was released by the dignitaries and BES awards were presented to the winners. The Information and Broadcasting Ministry is considering bringing a new Integrated Broadcast Policy for the growing broadcasting sector in India. Today, the second World Orange Festival has been organised in the city of Oranges Nagpur (18th-21st Jan 2019). The festival will showcase and brand the exquisite fruit in order to boost its export. This festival will be complete with seminars and exhibitions for the industry, master classes with master chefs for the foodies, installations by artists for the art lovers, concerts by the greats, domestic and international acts, games and much more scattered all through the city. Currently, Prabhat Singh is Special Director, Central Reserve Police Force (CRPF). S N Pradhan (1988 batch IPS officer - Jharkhand cadre) has been appointed Director General (DG) of National Disaster Response Force (NDRF). Currently, Mr. Pradhan is the Joint Secretary of the ministry of The Department of Development of North Eastern Region (DoNER). Former president of Vishwa Hindu Parishad (VHP) Vishnu Hari Dalmia (91-years) passed away in Delhi. Mr. Dalmia played a crucial role in the Ram Janambhumi agitation. He had also served as ‘Prabandh Nyasi’ (managing trustee) of Sri Krishna Janmasthan Mathura. The Vishva Hindu Parishad (VHP) is an Indian right-wing Hindu nationalist organisation based on the ideology of Hindutva. The VHP was founded in 1964 by M. S. Golwalkar and S. S. Apte in collaboration with Swami Chinmayananda.